There is no direct bus line from the town of Chania to the Park (Michelogianni street, Akrotiri). You can use the line "KOYNOYPIDIANA" ("ΚΟΥΝΟΥΠΙΔΙΑΝΑ") or "POLITECHNIO" ("ΠΟΛΥΤΕΧΝΕΙΟ") to the bus station denoted by A on the following map. Also, the line "CHALEPA - ERGATIKES KATIKIES" ("ΧΑΛΕΠΑ - ΕΡΓ. 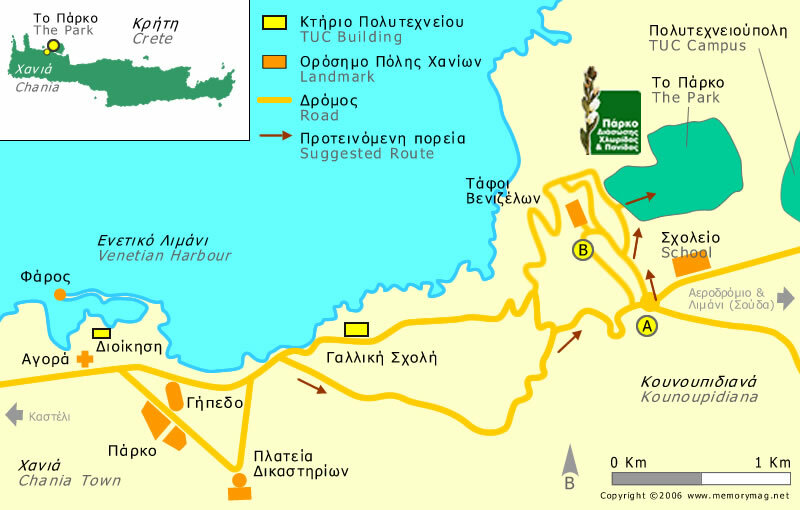 ΚΑΤΟΙΚΙΕΣ") when it passes by the Venizelos graves, denoted by B on the map. From Chania town to the Park - Bigger map (~70 ΚΒ). The Park (plan with land use).